From humble beginnings, with 23 students in 1995, and numerous expansions over the years, the latest being $2 million worth of new buildings (through government grants) last year, the Ananda Marga River School, set on 25 acres of rainforest land with a creek running through it, currently has over 200 children: 150 in the main school, ranging from Preparatory to Year 7 (5 to 12 year olds), and 50 in our new Early Childhood Centre, encompassing Pre-Kindy and Kindergarten. The school is governed by a Board of Directors, with a Management Committee overseeing the daily administration. A Parent Committee plans and organises parent and community events such as café nights and morning teas. We currently have around 40 staff: five in administration, eight in the Early Childhood Centre, a teacher and two assistants in Prep, eight teachers and four teacher aids for Years 1-7, a learning support teacher (our new learning support centre is appropriately called the Empowerment Centre), an art teacher, a music teacher, an eco-studies teacher, and eight other support staff for carpentry, grounds, cleaning and driving our three school buses. 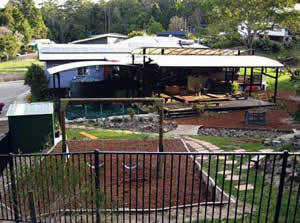 The school is registered as an independent school with the Queensland state government and is affiliated with Independent Schools Queensland. This year has been a year of consolidation at the River School. We moved into our new classrooms and administrative block, as well as a beautiful library/music room, tuckshop, new play areas, vegetable gardens and fruit trees, and a large gym/performing arts space. The grounds are also in the process of being landscaped and a team of local artists has been painting murals on walls, and even steps. All water heating is from solar panels, drinking water is from rainwater collected in tanks, other water is pumped up from the creek, and waste water is processed through sand filtration on site. Our new tuckshop serves organic, locally grown, sentient food to the children in the form of delicious concoctions such as sushi, spinach and feta triangles, falafel rolls, pizza, strawberries and yoghurt, and energy logs. The tuckshop was also recently showcased at the Sunshine Coast Real Food Festival, the proceeds going towards helping financially-challenged parents send their kids to school. Children learn the state government curriculum as well as meditation, yoga and ethics, art, music, drama, video-making, indigenous studies and eco-studies. It is a holistic approach, the emphasis on play-based learning for younger children and active learning (themes and projects) for older children. Child-to-child programs (kids teaching kids) is also a big part of the learning method. 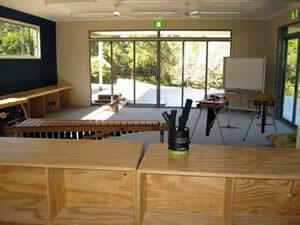 So the best in academics is taught in an atmosphere of creativity, the arts and play. Classrooms are equipped with interactive white boards, iPads, iMacs and laptops. 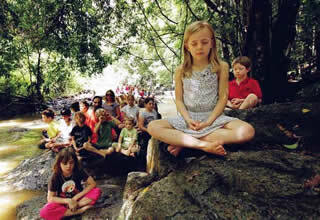 Over and above the academic curriculum, our prime focus is on meditation, yoga and ethics. Apart from the spiritual and moral essence of our day-to-day teaching, this takes on a three-tiered approach at the River School: first, a weekly all-school Morning Circle with songs, virtues, announcements and awards, ending with collective kiirtan and meditation; second, each class has a dedicated meditation and yoga session every week; and third, each class has 15 minutes of Quiet Time a day. We give a term meditation award for collective class effort, and we are about to implement our Super Meditators program by forming a weekly special meditation task force of the most sincere and enthusiastic meditators from each class, who will perform 20-30 minutes meditation at a time. Children get quality class time in music and have the option of additional private lessons in strings, guitar, piano and marimbas. They put their talent to good use by giving regular performances and recording CDs such as Joyful Things. A group of children recently busked on the main street of Maleny to raise over $700 for the Romania kindergarten renovation. This is a good example of the service emphasis at the school, which manifests in various ways to help students and parents in need, the local community and our global village. The standard of art at the school is quite exceptional, with the children regularly winning awards at local and Sunshine Coast exhibitions. The school also does well in regional sports, especially track and field, swimming and soccer. 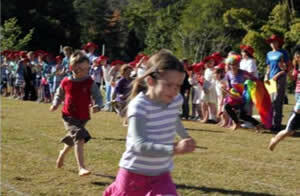 Our annual River School Olympics combines athletics with a great day out for children, parents and teachers. Environmental care and awareness is nurtured as an inherent component of Neohumanism. In addition to ecological class projects, children have ample opportunity to discover the joys of the rainforest setting during lunch breaks and swim in the creek during the summer months. We are currently organizing our annual River School Spring Festival, with an indigenous opening ceremony, class stalls, tuckshop café live music, book stall, healing space, dance space, film festival, art exhibition and competition, sports and games. I love our school. I love our school so much I want to be a teacher so I never have to leave it. It has a heart that beats on its own, the most amazingly devoted and incredible teachers and a spiritual philosophy that is hard to dispute. It’s blissful! I am more and more thankful for working in such a beautiful community I feel supported and nourished by something that the River School offers that is not necessarily tangible but is very much alive and rich; there is a deeper level of substance and truth that hovers over the place and infuses everything. I feel touched by this and the more I work here, the more I recognize it.